You may remember my blog post on the lesson of mindfulness. 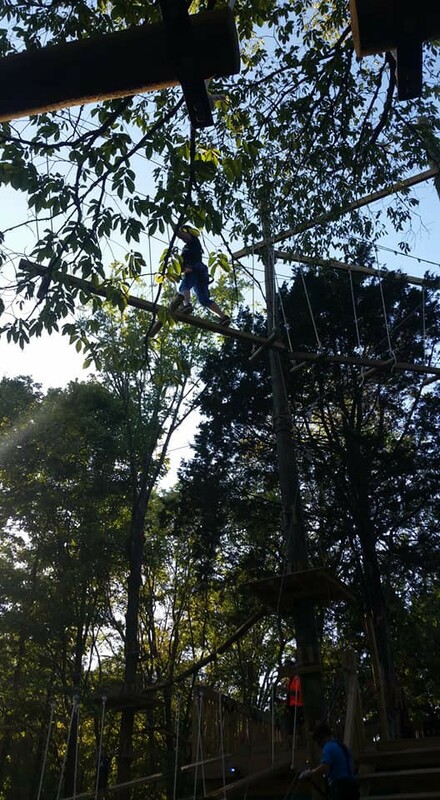 It was a lesson I learned when I went to the new Adventure Park Nashville ropes course. It was all about how important it is to focus on the moment instead of always thinking and planning ahead (something I’m guilty of). 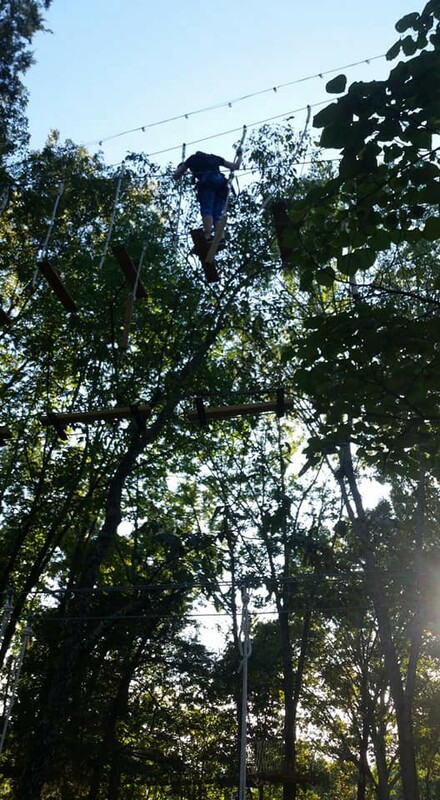 Well, when I returned to the ropes course and took a friend with me, it was obvious there was another lesson I needed to share with my readers. 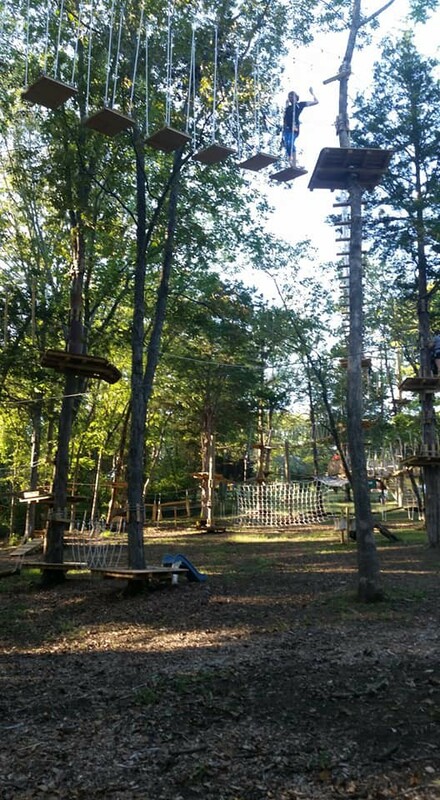 This time around I did some courses that were higher off the ground and more challenging. But what I noticed is not every element was as challenging as they first appeared. While applying the previous lesson of focusing on only one bridge element at a time, I’d arrive at a new element and would study its configuration to figure out the best way to maneuver across it. Upon first glance, most of them looked very complicated. But instead of thinking too much about how to get across, I would just take the first step onto the element. Once I did, it suddenly became clear that what looked like a real obstacle requiring a lot of thought and energy to maneuver was really very simple to get around. We as a society, myself and my clients included, often overthink things when instead we should keep it simple. I see this especially in my clients who are thinking about changing careers or starting their own business. They view the challenge in front of them and immediately start asking a bazillion questions about how they should start. I usually get a funny look from them as soon as it comes out of my mouth. I explain to them it doesn’t matter how or where you start, as long as you take one step to start. There is no certain order you have to follow. For someone looking to start their own business, it could be something as simple as securing a domain for your future business’s web site for less than $10. Or it could be first reading Pat Flynn’s book Will It Fly? How to Test Your Next Business Idea So You Don’t Waste Your Time and Money. For someone looking for a new job it could be as simple of a step as updating your LinkedIn profile. Or it could be reaching out to one person in your network. It’s just like the phrase of advice on how to eat an elephant: one bite at a time! Of course the idea of changing careers or starting a business seems very overwhelming at first when looking at it as a whole. But when you break it down into smaller steps, it’s not as complicated as it first appears. Each step is more simple than the process as a whole. And once you take the first step, you gain the confidence you need to take the next step. Before you know it, your steps have added up to a really big dent in your goal. To learn more about how to break your goals and obstacles into more manageable steps so you’re not overthinking things, subscribe to my newsletter and receive a complimentary copy of the 8-Step Goal-Achievement Plan. I started where most people start, looking for another job working for someone else doing the same thing elsewhere. Of course I wouldn’t leave my current job until I found my next job. Also I knew they lacked the ability to properly present themselves to a label (which is basically a job interview). Or in a media interview (I’d had some past experience in media coaching too). Is there something people tell you you’re good at? Is it something you enjoy? Do you see a potential market for it? I attended as many industry events as I could. And I conducted informational interviews with several people in the music business, always asking for the names of two or three other people I should talk to. Once I was on my own, I was already getting used to working for myself. And there wasn’t as much to fear as I would if I’d left my day job and then started a business. But, what I saw happening all around me was people being laid off. They were being forced into becoming their own boss with no real planning or preparation. Click here to read more about the myths of the common fears of leaving your job. Throughout my time as an image consultant I continually made connections through networking. This turned into additional ways to supplement my income with my growing business. Are there connections you have now in your current situation which could benefit you in the future? Are there connections you’d like to start making? What are some things you can fall back on to reduce financial risk when your daydream business is slow? Unfortunately my time only lets me do one additional gig to my full-time daydream. How can I start planning my exit strategy for my day job and my entry strategy to my daydream? How can I reduce unnecessary risk? And how can I maneuver around inevitable risk? I simply started setting goals and then taking small steps toward achieving those goals. You may want to pursue your daydream of starting your own business but think it’s impossible. Want to know the biggest lessons I’ve learned in the past 10 years working for myself as a freelancer (so you don’t have to learn them the hard way)? Check out my post 10 Lessons I’ve Learned From 10 Years of Freelancing. Click here for more resources and posts on the topic of working for yourself. If your career goal is to become a public speaker, or to offer a service where public speaking will be one of your revenue streams, you should first read this. Oftentimes independent service providers and industry experts get asked to speak on their particular areas of knowledge to a local group or at a special event. I’ve been called to do so several times. Here’s how the scenario typically plays out. Which of the following would be your initial reaction if you got this call? Most people’s reaction is typically one of the above emotional reactions, depending on how long they’ve been in business. But when you take the emotions out of the situation, what should your rational response be? Should you take the unpaid speaking gig, or not? Before we answer that question, let’s consider a few things. Do you really need the exposure? It might be early in your business and you need to get your name out there. Therefore, you may have to do a few free speaking gigs, but eventually will have to transition to opportunities that are more of a win-win. Is the cause near and dear to your heart? If you’re being asked to speak to a non-profit or a cause that’s near and dear to your heart, and your expertise will greatly benefit those being served by that non-profit, by all means provide your speaking services for free! I have developed a great relationship with a local faith-based organization that helps those who are stuck in poverty get out of their vicious cycle of hardship. Every quarter I go in and teach job interview skills and conduct mock interviews with those enrolled in their work-life program. I know this audience cannot afford my services and I don’t expect them to turn into clients. I provide my presentations to them and the organization as a way to give back to those in need. While I once used to speak to groups for exposure, I now limit my free speaking services to organizations like the one described above. Is there another way to get the exposure you need? Free speaking gigs aren’t the only way for you to get exposure for your business endeavor. There are other alternatives. For instance, I love to write and it doesn’t require as much of my time as preparing a presentation. I definitely get a much bigger return on my investment of time with writing than I do with any free speaking gig. I provide a ton of free content here on my blog, on my Medium and Quora accounts, and in several published articles. Since I have clients located in various states, it makes much more sense for me to provide free content online to an unlimited audience than it does to a small audience only in my local area. In fact, one of my Quora articles providing free resume advice has over 150,000 views and several hundred upvotes. I could never get that kind of exposure with a speaking gig at a local organization! So back to the question of should you say yes to a request to speak for free? What kind of win-win situation is potentially available if you agree? Is it one that benefits the organization’s audience while also benefiting you? For example, could this be great practice for a future public speaking career? Or if you later decide to add presentations to your income stream? How you choose to handle this situation can set the tone for all future speaking gigs. Also, it can either make or break your piggy bank if you get these kinds of requests on a regular basis. You definitely don’t want to develop a personal brand as someone who will do everything for free! To help you decide on your response, below are a few suggestions I shared from my own personal experience with the Freelancers Union Nashville chapter. First, wait until the emotions (excitement, uncertainty, fear, etc.) subside before agreeing to anything. Ask for a couple of days to check your calendar and get back to them with an answer. Then, in those couple of days, spend some time developing your priorities and a strategic plan for agreeing to non-paid opportunities (because if you get one request, you’ll like get more requests!). Your plan should be made up of two lists: a “SAY YES IF” list and a “SAY NO IF” list. If your target market/ideal client is represented in the audience. But don’t take the caller’s word for it. You know your market better than they do. Do your research and ask enough questions to determine if your market will actually be represented. If they allow you to promote your own business/services or sell your products at the end of your talk. If you get to choose a topic that doesn’t require a lot of time for additional research and preparation on your part. It should be a topic you know well enough to speak on without any notes. If it’s simply a Q&A or a panel with other experts, that’s even better because those scenarios require little to no research or preparation. If the prep and delivery time doesn’t cut too deeply into your billable hours. Always keep your paying clients and paid projects your top priority. If they offer to give you an honorarium for your time and expertise. It’s okay to ask them if they ever do that for speakers who agree to come speak for significantly less than what you’d normally charge and/or what other speakers would typically charge. If the organization is related to a cause that’s near and dear to your heart. If at least 3 of the criteria from your “SAY YES IF” list aren’t met. If you’re not allowed to invite participants to visit your web site or subscribe to your newsletter. Feel free to add your own criteria to each list. Remember, it must be a win-win situation or you’ll become resentful! Beware though, when enforcing your criteria people may accuse you of having a sense of entitlement. But it’s not entitlement if you’ve worked hard in your industry to gain the knowledge you have. Besides, who’s really the one with the sense of entitlement? Could it be those expecting you to give them something for nothing? You don’t want to say yes to every opportunity. Doing so will cause you to not only lose money but also time you could dedicate to your paying clients. You also don’t want to say no to every opportunity (no matter how fearful you are of public speaking) because you’ll miss out on helping others and also getting your name out to potential clients. The trick is to be strategic about it. Include presentations into your business as an additional revenue stream since your topic is in high demand. Then charge accordingly. Limit the number of free gigs you do per year to only a few. This will require you to be selective in which organization you want to donate your time and expertise to. Public speaking or performing on a stage can be an extremely stressful thing. In fact, it’s the number one fear, before death at number five and loneliness at number seven. It can even be stressful for those who love it or have done it for years. Ozzy Osborne has been performing onstage for over 40 years and admits to still getting jitters before every show. Even though I’m energized during or right after a big presentation, I experience a looming sense of dread the week leading up to it. If you also experience this kind of stress, it can be a tremendous cost to you, including lost sleep or sickness from nervousness. In addition, you’re sharing your expertise, which is basically your intellectual property. It’s what your clients are already paying you for. You deserve to be paid for your knowledge, and you also need to be fair to your paying clients! If you have knowledge and expertise that people want, then it’s in demand. Don’t worry if you present it in a different way from other popular speakers. As long as you’re providing something helpful in an engaging way using your own unique approach, then you’re worth getting paid something. Last week I posted an announcement about the celebration of paNASH’s 10-year anniversary. In it I told how I started my freelance business, the fears I faced in leaving a secure job to go out on my own, and how my business’s mission has evolved. Today, I want to share some of the freelance lessons I’ve learned over those ten years in working for myself. I hope they will serve as an encouragement to those who are thinking about starting their own thing, are new to the freelancing world, or have been in it long enough to have faced some common struggles. I had to be disciplined. Being your own boss requires A LOT of discipline. Why? Because there’s no one looking over your shoulder to make sure you’re showing up on time or getting your work done. Discipline has always come naturally to me, and I was raised by a former Marine Corps officer who further instilled this trait in me. This is not to say that discipline can’t be learned later in life. But the discipline required to work for yourself will make things easier if you’ve already mastered it through other methods such as playing a sport, sticking with a commitment, etc. I had to use my love for life-long learning. I’ve always loved learning new things. And I realized the need for constant learning when starting a business because “a skill does not a business make” according to my friend and colleague Melody Bowers, co-owner of VirtualCollective. You need to either already have some business sense, or be disciplined enough (see lesson #1) and have the ability to learn it as you go while managing your other responsibilities. If there’s something you can’t learn, there’s always someone else who has the knowledge you can pay to either teach you or to do it for you. I learned I had the ability to figure out the logistics. It turns out the things that seem intimidating at first (i.e. getting a business license, paying for your own health insurance, tracking your income & expenses/P&L, etc.) aren’t really all that scary. In fact, a lot of this not-so-fun part of having your own business is easier than you think. And Freelancers Union has made a lot of it very simple. They provide tips and resources on the logistics of running your own freelance operation and even provide access to affordable insurance. I learned what I’m worth. The toughest thing for me was figuring out my pricing. At first it was hard to know how much to charge. And even when I thought I knew, I then had to figure out which pricing model worked best. An hourly rate? A day rate? A package or retainer rate? Like most people first starting out, in the beginning I was devaluing my skills and expertise. But, after I started getting clients and began listening to their feedback on the services they received, I started to better understand my worth. Yes, it helps to look at your competition and the average rate others charge for the same service or product to get an idea of what you should charge. But, what helped me most was asking current and past clients if they would’ve paid more based on the value they’d already received. To my surprise, most of them said yes, and even some told me flat out I was undercharging. Now, most people (both potential and current clients) say my pricing is reasonable and fair. It took some tweaking and trial and error, but now my pricing structure is in harmony with the service I’m providing. I learned when to say no. This included being selective of potential clients, turning down certain speaking gigs/presentation requests, not wasting my time with potential contacts who only wanted to talk about themselves but never wanted to listen or make the relationship mutually beneficial, discontinuing professional relationships when trust had been broken, etc. This is difficult to do when first starting out. Especially when it comes to turning away money. But, I can tell you the times I listened to my gut and turned away the opportunities that weren’t the right fit for my business, I was always glad I did. The times I didn’t listen to my gut, I always regretted it. I learned not to compare myself with others. My pastor’s wife always says, “Comparing yourself to others makes you either small or smug, and neither of those are good.” I realized because I do what I do in my own unique way, comparing myself to my competition is a waste of time because it’s like comparing apples to oranges. The same is true for you because you also have your own unique way of delivering your service or product that no one else can duplicate. Instead of comparing, focus on what makes you and your brand solely yours. This is what becomes your selling point! I learned (and am still learning) when it’s time to shift gears. When learning to drive a stick, you start to develop a feel for when it’s time to shift gears. This doesn’t mean you won’t grind your gears on occasion. The same is true in running a business or working as a freelancer. You’ll start to learn when to give something a little more time to grow before uprooting it. When to pull the plug on what’s not working. And when to simplify if you’re trying to do too much or be too many things. This type of self-awareness can mean the difference between success and failure. I realized the real risk. At first I thought the obvious risk of starting my own thing was leaving the security of a full-time job with benefits. I was wrong! Since leaving my job at a prestigious university where there were constant hiring freezes and multiple firings, I’ve had more job security than ever before. I’ve been able to develop the grit and skills required to work for myself and bring in a steady stream of clients, to supplement my income at times when the stream was unsteady, and to eliminate the salary cap I had at my previous job. The only real risk I faced was potentially losing any or all desire to work for someone else again. Let’s face it. It’s pretty hard to go back to working for someone else after having worked for yourself. But if I ever had to again, I’d be very selective in who I worked for (see Lesson #6). I learned fear is inevitable. Fear is not a reason to not venture out on your own if it’s what you truly desire. Instead, it’s often an excuse. Everyone who’s ever done this has had some level of fear. Do your research. Prepare (but don’t wait until you feel fully prepared because that will never happen!). Then push through the fear.